Solus keeps up with the latest technological advancements by providing a new range of indoor/outdoor biometric and contact less smart card terminals, which is compatible with every Access Control System and is highly compact and easy to install. This reinforces the system's Overall level of security. Totay most physical access control systems in use are based upon Smart cards, PIN (Password Identification Numbers) or Combination of these. UNfortunately this does not not prevent individuals from using someone ele's card or ID to enter to a restricted area, thus utilizing the system flaw known as "Proxy Punching". Security & Administration authorities do demand the card bearer's identity to deal with this issue. But again this option becomes human dependent; to automate this process, they strongly recommend use of biometric technologies to providee strong user authentication and avoid such security breach. When Biometric is combined with contactless smart cards, this ensures speedy, multi-factor contactless smart cards, this ensures speedy, multi-factor user authentication, and hence reinforces the system's overall level of security. ID08 has Stand-alone or networked(Wiegand)modes. 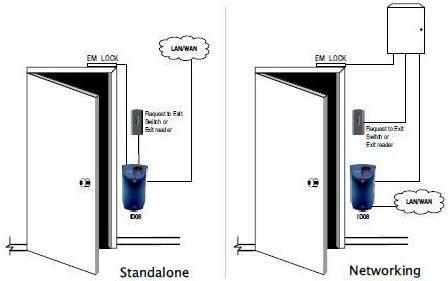 It's an ideal choice for smaller installations where single unit can be used as a complete one door Access Control System. This means biometric verification, access decision, lock control and record storage all happens on the same unit and unit directly communications with Access & Terminal Management Software. Specialty: ID 08 can be connected to any third party access control panels or an existing installation using configurable Wiegand Output. This is an ideal choice for larger companies with multiple readers and Access Control Installation applications. Built in TCP/IP: Terminal Managment, which includes initial configuration, firmware upgrade, log retrieval, biometric database operations etc., is made possible through TCP/IP in all modes. SBAA Enrollment & Management System Application: This is used to register individuals (templates can be on reader/card), and manage a group of terminals connected to a network (i.e. downloading databases and configuring a terminal remotely). This application also allows adding a biometric function to an existing access control system without changing it. It can also be used independently of these facilities to provide a simple access control system. SBAA supports the ID08 series, and other Solus Terminals Time Prox & Time Smart Bio, Solus Controllers DAC02 & 04 PS & IPW Series. The ID08 retains common appearance and aesthetics, while offering both Biometric & Smart card options in same packaging thus allowing the client to choose technology based on security requirements. Mounting: A wall-mounted plate requires four screws. It is compatible with US/EU electrical boxes. Power over Ethernet Option (to be ordered separately) makes ID08 easier to installa as cabling requirements shrink to only CAT 5 LAN cable connection. Manages up to 5000 users, two templates each, in identification mode. Supports ISO14443-A MIFARE and DESFIRE cards.